Last year while hunting about the Art/Designer Toy area of the SDCC Hall I came across Funko and their amazing array of repaint exclusives. As a general un-fan of Bobble-heads I had avoided most of their product but could not resist the metallic-color repaint of their UMM Frankenstein figure. As a result they are forever after a must-go-to booth for me and this year was much the same. Bobble-head exclusives were pretty minimal this year, with the obvious focus being on their recently launched (as in the last year or so) Pop! brand of stylized figures. It's a great range of product that I've successfully avoided mainly because A) I don't see it around (though, post-SDCC I've seen that Target has started carrying them) and B) like Mighty Muggs I could get addicted very easily. 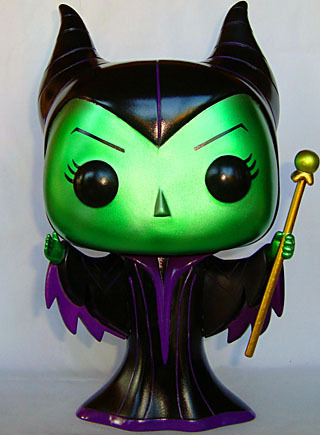 However, when confronted with a large scale Maleficent from Disney's Sleeping Beauty in metallic colors my knees went weak and constitution, flaccid. I was powerless against its $50 price tag. Metallic paint is one of my toy kryptonites (i.e. it makes me significantly more likely to purchase) and second in power only to metallic blue paint is metallic green paint. 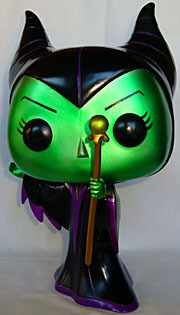 Thus, looking into the glorious sea of shiny emerald this worst of all witches cast her spell. The paint is easily both the best and worst thing about this figure. On the good hand: it's what makes it unique and exclusive to the Con, and it really helps the design and overall aesthetic... pop (forgive the pun) while being immediately eye catching and visually engaging. On the bad hand: it has all of the sloppy paint lines that seem to plague close inspection of any Funko product, or at least in the Pop! range. Indeed this was the best of about 10 or so I inspected pre-purchase. The sculpt is pretty simple, running with the "Big Head, Little Body" blueprint of Bobble-heads, it takes a hard left into the realm of stylized aesthetic, with a squarish head and the trademark black-dot eyes as the only facial feature. Overall it works very well for me and strikes a great balance between the gorgeous and iconic Villain and attractively simple looks of the overall line. The two arms are separate but clearly unarticulated pieces glued in place. My understanding is that the normal line are all bobble-heads, but here we have a simple swivel joint at the neck. The head is definitely hollow and I believe the body is as well, but the latter has thick enough "walls" which add enough weight and stability so that standing is not an issue. Beyond paint, the size is also what makes this lady special. Standard Pop! 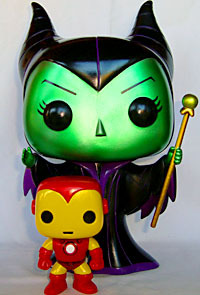 figures stand around 4" tall while Maleficent here is 11" tall (to the top of her horns). Talking to the reps at the both, this is a "trial launch" of the large format to gauge interest. I think the pricepoint is significantly too high to really catch on (normal Pop! figures are $10, but the exclusives were $15, so I'd estimate a non-exclusive 200% scale figure to run about $40). Response seemed positive to the rep I talked to, and I certainly dug her, but come Sunday they looked to have more of the two 200% sized figures left than any other exclusive (the other character being Buzz Lightyear). The packaging shows Maleficent, Buzz and "Steamboat Willie" Mickey so my guess is these three will show up as 200% sized Disney Store exclusives with non-metallic paint in the not-too-distant-future. This is a great Convention Exclusive. It's a cool, fun surprise of a find, and while it is a fantastic spin on a great character and existing figure, it's not something that would be a noticeable hole in your collection. The $50 price tag is 10-to-20 too much, but I'll go with it for the "cool" factor and the low run of only 360 produced. While the paint, particularly around the face/cowl, is remarkably subpar, the metallic green just looks too darn good to be fully ruined. 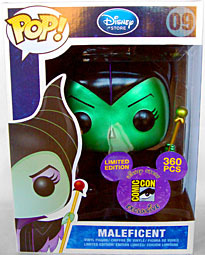 In fact, I like this lady so much I'll probably end up tracking down the standard 4" version too.